Dominant performance: Indian Hoopstar live up to expectations in the finals. 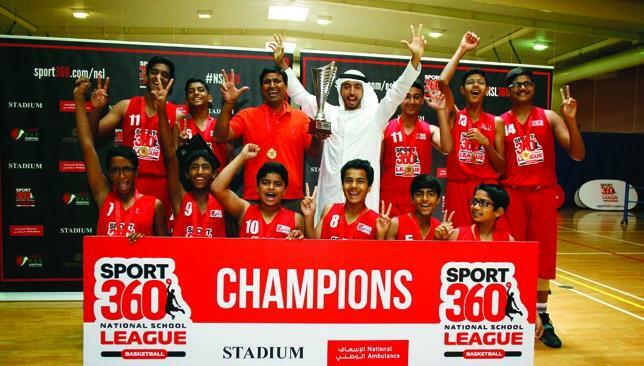 Indian High School Dubai didn’t leave any doubt of their top standing in NSL under-14 as they beat International Choueifat School 31-15 to claim the championship. After having a strong hold on their age group from the start, IHS finished off their campaign in style on Saturday at Victoria International School Sharjah. Despite a defensive gameplan by ISC to neutralise their leading scorer Lavesh Zuting, Indian Hoopstar had more than enough firepower. Ahmed Thahir scored a team-high nine points, while Zuting acted as a facilitator to finish with eight points and two assists. “It feels great because we performed really well and we got first place. There are no other words for it,” said Zuting. The point guard walked away with NSL Final MVP for his efforts against ISC and NSL MVP for his marvelous play throughout the tournament. Having a player who can control the floor like Zuting is a privilege IHS coach Subhash Dhaka is more than happy to have, making life on the sideline easier. Heading into the match-up, ISC coach Stefanita Buzatu recognised he had to shift more attention to Zuting and while the gameplan relatively limited the guard, Buzatu believes his team ran out of gas on the other end of the floor. The big man duo Kareem Eid and Gohar Hussain pulled down a combined 23 rebounds, but managed just four points total against the interior defence of IHS. Point guard Khalifa Khouri was the catalyst with nine points to lead the way, but the rest of the attack couldn’t find their rhythm. Despite falling short of the title, Buzatu believes his players have made significant strides and represented Abu Dhabi well. For Indian Hoopstar, most of their championship-winning players will move up to the under-16 level in next year’s tournament, where Dhaka is confident more success will follow. Job done: VISS players are elated after winning the U16 title. 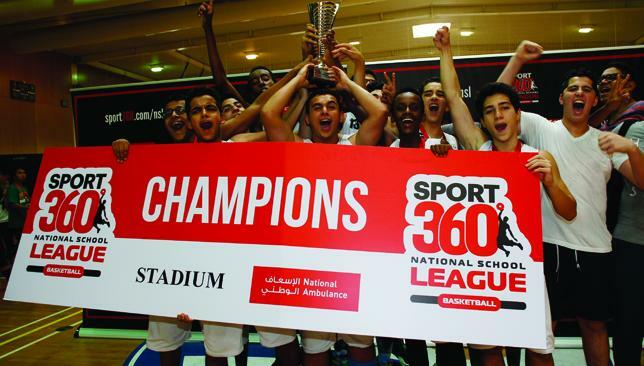 Victoria International School Sharjah were crowned inaugural champions of the NSL under-16 basketball league, defeating New Filipino Private School 42-41 in an electrifying final. Both VISS, which played host, and NFPS had their supporters out in full force and the game matched the atmosphere as the final seconds were needed to decide the result yesterday. Hashim Hazeem and his size made the difference for VISS in a contest that had a razor thin margin for error, accounting for 21 points, 20 rebounds and six blocks in a dominant effort. Fittingly, Hazeem had his hands on the ball in the concluding moments to seal the title. inbound pass to give the ball back to NFPS with a chance to win. On the ensuing NFPS inbounds pass, however, Hazeem more than made up for the mistake by diving to the floor to secure the botched pass, resulting in a jump-ball and possession for VISS with 0.4 seconds left. Hazeem then snagged the overhead baseball pass as time expired and the squad immediately exploded in celebration. “I was in shock and I didn’t know I stepped on the line. I thought I had to redeem myself and make up for it,” the towering centre said. Just seconds earlier, NFPS had fought back from a five-point deficit and tied the contest on Eric Pancito’s deep 3-pointer. Bringing the ball up for VISS, Seraj Farhart drew a foul and nailed his first free throw before Ahmed Abdulle – who finished with 11 points – grabbed the missed second attempt and layed it back in to give his side a three-point lead. NFPS then scored on a quick runner before VISS suffered the violation on the inbound pass. VISS jumped out to a 7-1 lead and were either ahead or within close striking distance throughout. The pace and defensive pressure by NFPS made life difficult for VISS, but the effort fell short in the end. “It was ours to lose, in my opinion. I was confident going into it and the boys had the ability,” VISS coach Russell McKie said. NFPS were relentless with their full-court pressure and transition game. Jeff Ryan Bustos scored a team-high 17 points, while Pancito added 12, but the offence had trouble penetrating the fortress of Hazeem in the paint in the half-court. NFPS coach Aris Peralta admitted: “Every time they passed to Hashim, we couldn’t do anything. There’s nothing we can do to stop him. We don’t have somebody to match him. Along with the championship, Hazeem earned the honour of NSL Final MVP, as well as under-16’s Best Defensive Player and Most Number of Points Scored. Inaugural under-16 champions sounds great to McKie, but so does a repeat. “All but one of my players is eligible to play in under-16 next year, so it’s their championship to lose,” he said. Hashim Hazeem wins the Under-16 awards for Best Defensive Player, Top Points Scorer and Most Valuable Player of the Final as his VISS side beat NFPS Patriots 42-41 to become the first National School League Basketball champions.